Rob Kiser|Call Photo Edison State’s Navie Garber tips the ball over the net Monday night. Rob Kiser|Call Photo Edison State’s Kelsey Peters bumps the ball as Vanessa Winner looks on. 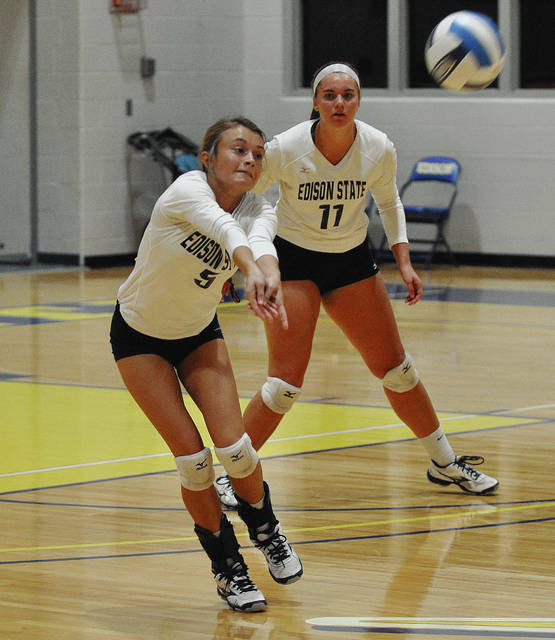 Rob Kiser|Call Photo Edison State’s Camille Odle goes low for a serve receive Monday night. 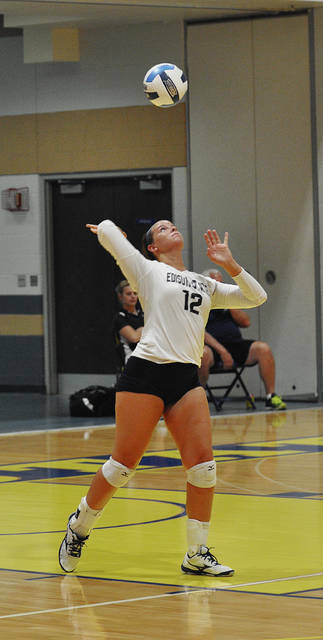 Rob Kiser|Call Photo Edison State’s Whitney Pleiman sets the ball Monday night. 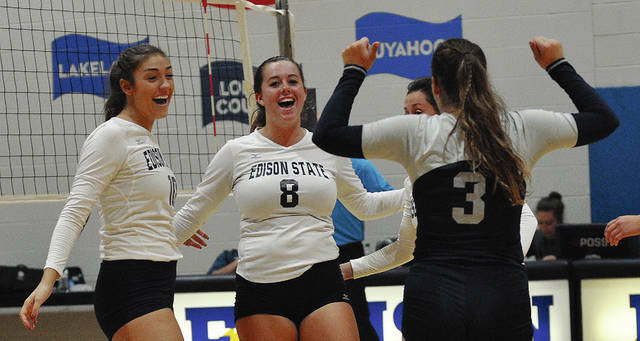 The Edison State volleyball team found themselves in a difficult position against the Heidelberg JVs Monday night before the match ever started. Setter Noel Ufferman, who has 461 assists this season and middle Aimee Powell, who has 104 blocks and 76 kills, were both missing from the lineup. And while the Lady Chargers battled to the end, Heidelberg was able to come away with a 25-22, 25-19, 17-25, 25-22 win, dropping Edison’s record to 14-4 on the season to start a busy week. 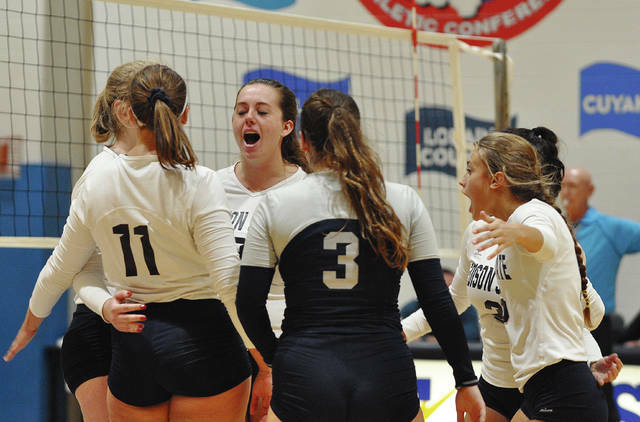 The Chargers have three more home matches this week, beginning with Clark State Wednesday, followed by Miami University Middletown Friday and Lorain Community College Saturday. Edison got in a 20-13 hole in the opening set and battled back to 23-22, before losing the two points of the set.. In the second set, Vanessa Winner had a kill to get Edison within 19-18 and Kelsey Peters had an ace to tie it at 19, before Heidelberg scored the next six points to finish the set. That’s when Brandewie decided to make a change. 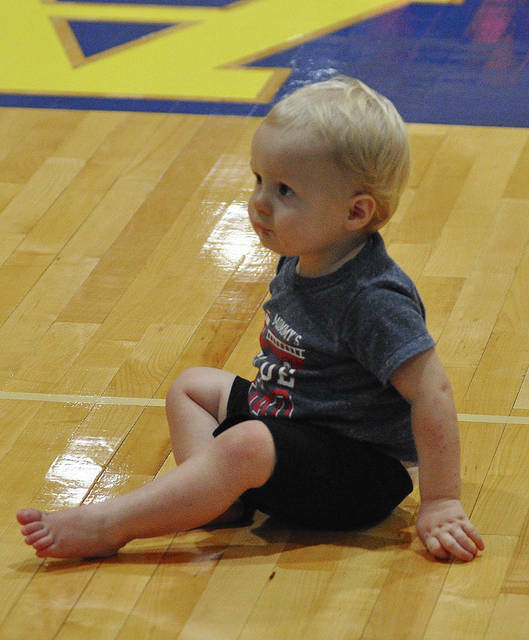 Libero Whitney Pleiman took over the setting duties and Camille Odle put on the libero jersey. That seemed to change the momentum. The Chargers took an 11-9 lead on Odle’s serve and a kill by Miranda Hickey made it 14-12, before three Heidelberg hitting errors on Hickey’s serve stretched the advantage to 17-12. The lead reached 22-15 on a kill by Reagan Morrett and Heidelberg was called for a lift on Kathryn Lee’s serve to make it 23-15. After two Heidelberg points, Morrett had a kill for sideout and Odle forced a fourth set with a service winner. The fourth set was evenly played. Peters served the first two points of the set and a kill by Hickey made it 3-1. A Hickey kill on Peters serve tied it 9-9 and a kill by Navie Garber on Winner’s serve evened it at 13-13. It was even at 15-15 after Heidelberg hit the ball long off Lee’s serve and tied 18-18 after a service point by Peters. Winner had a kill to tie it again at 19-19. 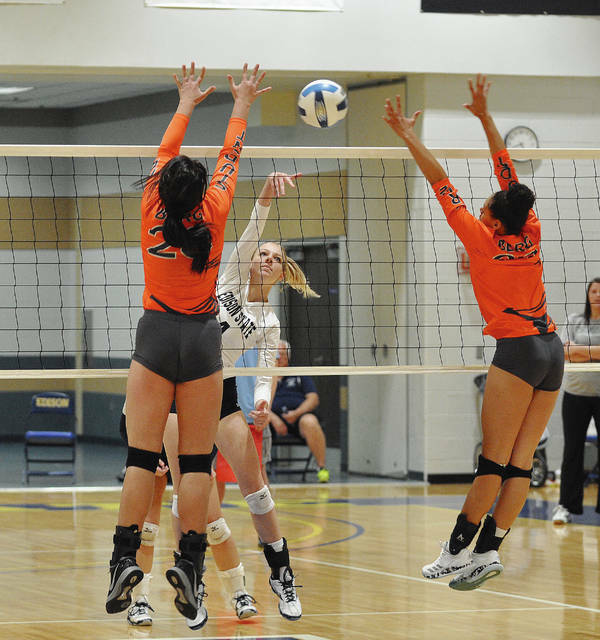 But, Heidelberg was able to put the match away from there, despite kills by Winner and Cali Stewart. 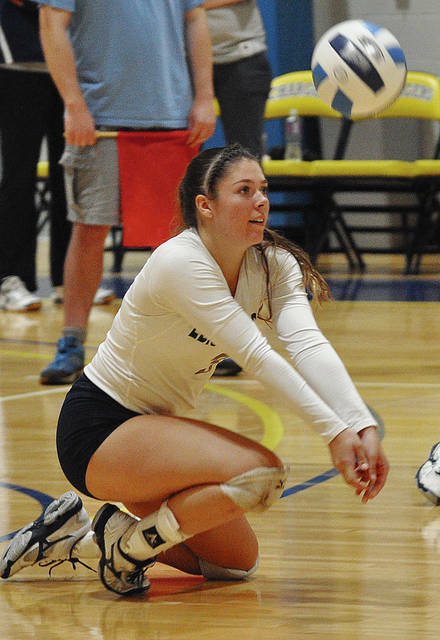 Morrett pounded 10 kills for the Chargers, while Hickey had nine and Winner added eight. Hickey had eight blocks and Stewart added six. Pleiman had 17 assists and 27 digs, while Winner also had 27 digs. Peters had 14, Odle added 13 and Lee had 11. Edison will host Clark State at 6 p.m. Wednesday. https://www.dailycall.com/wp-content/uploads/sites/30/2018/10/web1_navie.jpgRob Kiser|Call Photo Edison State’s Navie Garber tips the ball over the net Monday night. 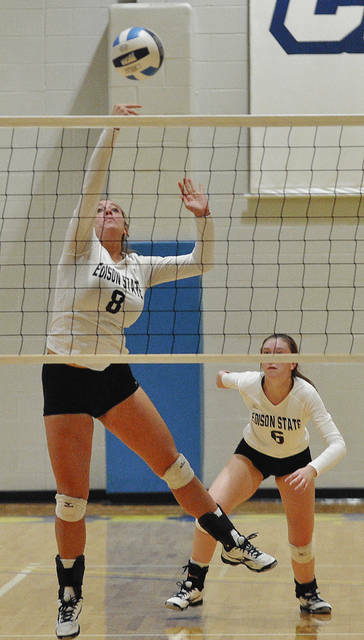 https://www.dailycall.com/wp-content/uploads/sites/30/2018/10/web1_kelsey.jpgRob Kiser|Call Photo Edison State’s Kelsey Peters bumps the ball as Vanessa Winner looks on. 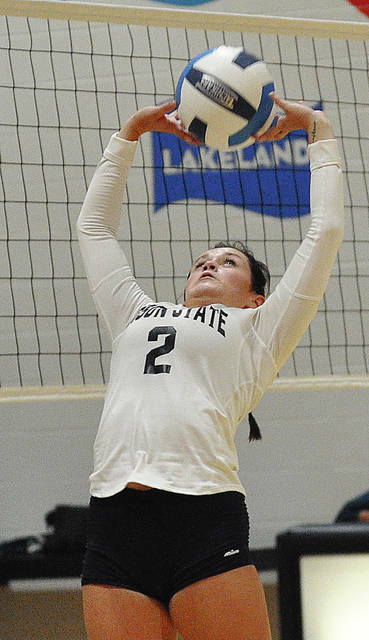 https://www.dailycall.com/wp-content/uploads/sites/30/2018/10/web1_camille.jpgRob Kiser|Call Photo Edison State’s Camille Odle goes low for a serve receive Monday night. https://www.dailycall.com/wp-content/uploads/sites/30/2018/10/web1_whitney.jpgRob Kiser|Call Photo Edison State’s Whitney Pleiman sets the ball Monday night.